Danzinger Red, dry red made with the Frontenac grape. Bronze medal winner 2014 Wisconsin State Fair Wine Competition. 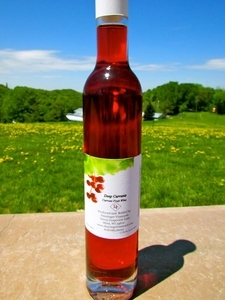 Sunset Ridge, semi-sweet red made with the Frontenac grapes. Bronze medal winner 2014 Wisconsin State Fair Wine Competition. Sweet Alma Red, sweet red made with the Frontenac grapes. Silver medal winner 2014 Wisconsin State Fair Wine Competition. St. Croix, dry red made with the St. Croix grape. Gold medal winner 2014 State Fair. Marquette, dry red made with the Marquette grapes. Bronze medal winner 2014 Wisconsin State Fair Wine Competition. 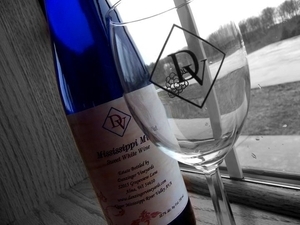 Twilight Delight, semi-sweet red made with the Marquette and St. Croix grapes. Bronze medal winner 2014 State Fair Wisconsin Wine Competition. Sold Out!! Sweet Ruby, sweet red made with the Marquette grape. 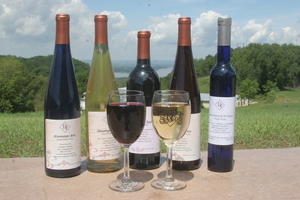 Won a Silver Medal at the 2013 Wisconsin State Fair Professional Wine Competition. Sweet rosé with our Frontenac Gris grape. Silver medal winner 2014 State Fair Wisconsin Wine Competition. Sold Out! November Dawn, semi-sweet red made with a blend of grapes.